One of the changes as a result credit card legislation is that credit card companies must explain how making minimum payments will impact you. Here's what to look for. When you get your credit card statement, there should be an easy-to-understand summary of how your balance is affected by only making minimum payments. The bills should explain that if you only pay the minimum, it takes longer to pay off the balance, and you end up owing more interest. The summary should tell you how long it would take to pay off the balance and how much interest would be paid by making only the minimum payments. It also should show how much to pay each month to pay off the balance in three years, and how much interest would be paid over that time. Anytime you can avoid paying too much interest on credit cards, you are freeing up money for other purposes. Think of it this way: If you double your monthly payments to pay off a credit card faster, the interest you save can be put toward another debt, funding a savings account, or purchasing something you otherwise couldn't afford. The new credit card regulations offer some protections against random interest rate increases. Credit card companies won't be able to raise interest rates on existing balances unless a promotional rate ends or you have a variable rate. 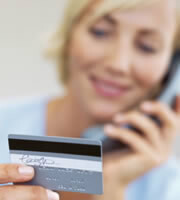 Credit card rates also could rise if you are late with a payment. The new laws also limit universal default, which is when a card issuer raises your credit card rate because you were late on a payment to another creditor. Credit card companies won't be able to use universal default with existing balances. However, they can still use universal default on new balances, but they must give 45 days' notice of a rate increase. Another important change is that you must be given the right to opt out of major changes being made to your credit card. When you opt out of these changes, your account would be closed, and you would be able to continue paying off the balance at your current interest rate. Do not ignore mailings from credit card companies. Make sure that you understand exactly what's happening with your bill so you can be an informed consumer. 0 Responses to "How Making Minimum Payments on Your Credit Card Can Affect You"